I am temporarily residing in Indore, so when there was a day of holiday on 15th August 2013, me and a group of friends decided to visit the fort town of Mandu. 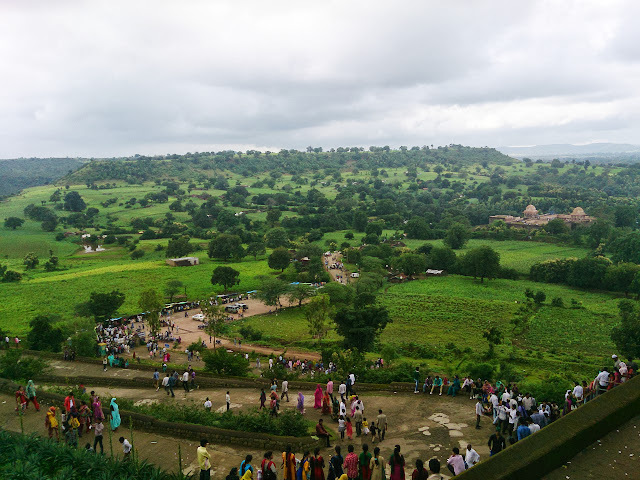 Mandu is around 100 Kms from Indore and one has to go through AH 47 and NH3 to reach there. Entry into Mandu is through a series of stone doors. Most of these are narrow, just about one vehicle can go through at a time. 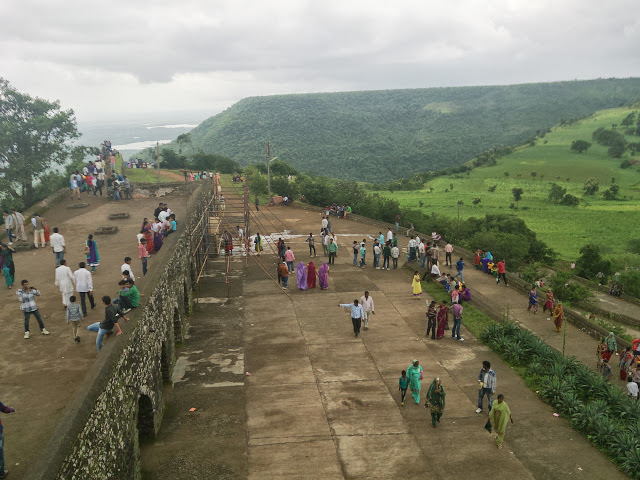 It takes around 2:30hrs of driving to reach the town of Mandu. 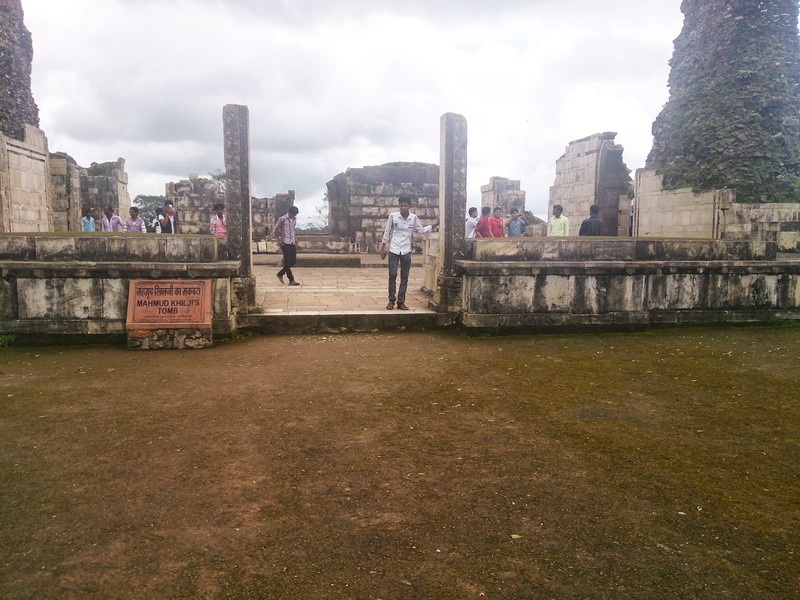 One of the first places that one comes across is the central group of monuments. These are as follows. architecture. The monument itself does not seem to be in great shape and is undergoing serious restoration work by ASI. 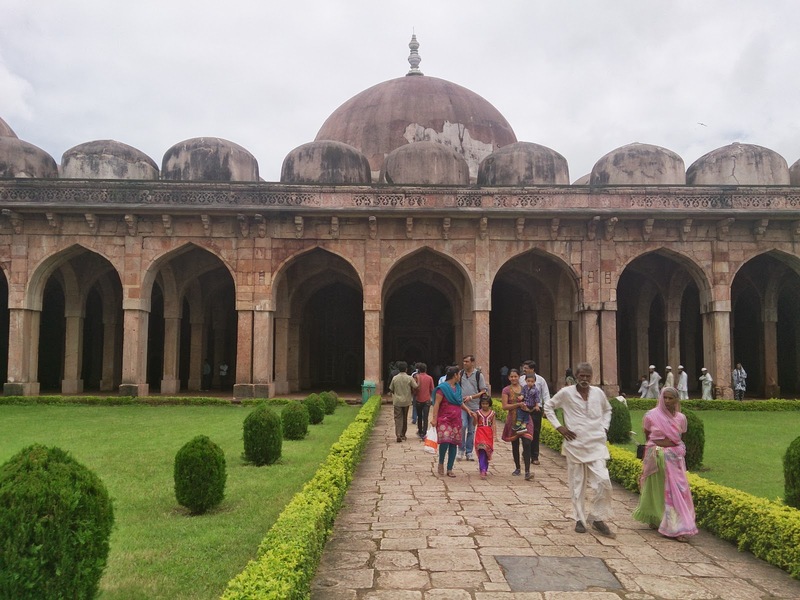 The story is that Shah Jehan sent four of his great architects to study the design of the tomb before the Taj Mahal's construction was started. Jami Masjid -- Inspired by great mosque of Damascus, it has high plinth and huge domed porch. Once you cross the entry dome, there is a large courtyard with open spaces. 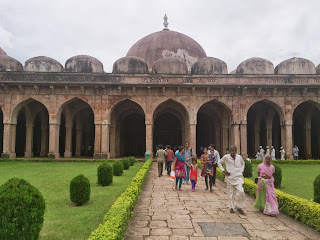 Just opposite the Jami Masjid is the Madarasa, Khilji's Maqbara and some other set of structures. These structures are not in great shape. Except the Madarasa which is in the ground floor, the upper floor is almost falling apart. The description on the site says that most of the structure fell apart because of hasty and faulty construction. 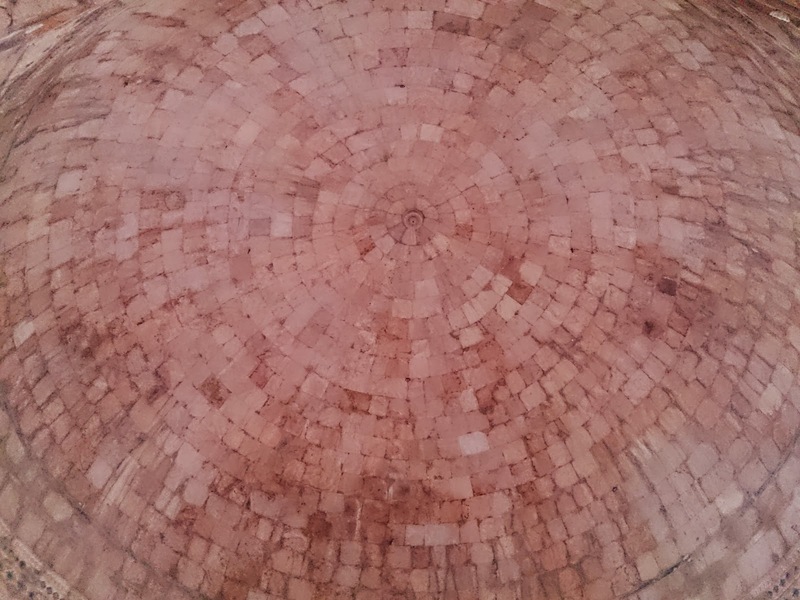 The next place that we saw was the cluster that holds Baj Bahadur's Palace and Rani Roopmati's Pavilion. This place was horribly crowded. There probably were hundred's of cars stuck on the road leading to the monument and thousands of people were in the monument itself. We had to leave our car stuck in traffic around 1.5 Kms before the monument and walk to the monument. Since the entry fees is just Rs. 5/- everybody who has some time to kill, shows up here. Most of the crowd really has no interest in the monuments themselves but they reach here because there is no other place to go. The story of Baj Bahadur and Rani Roopmati is a story of Love. Wikipedia defines the story as follows. Once out hunting, Baz Bahadur chanced upon a shepherdess frolicking and singing with her friends. Smitten by both her enchanting beauty and her mellifluous voice, he begged Roopmati to accompany him to his capital. Roopmati agreed to go to Mandu on the condition that she would live in a palace within sight of her beloved and venerated river, Narmada. The story did not really have a happy ending. 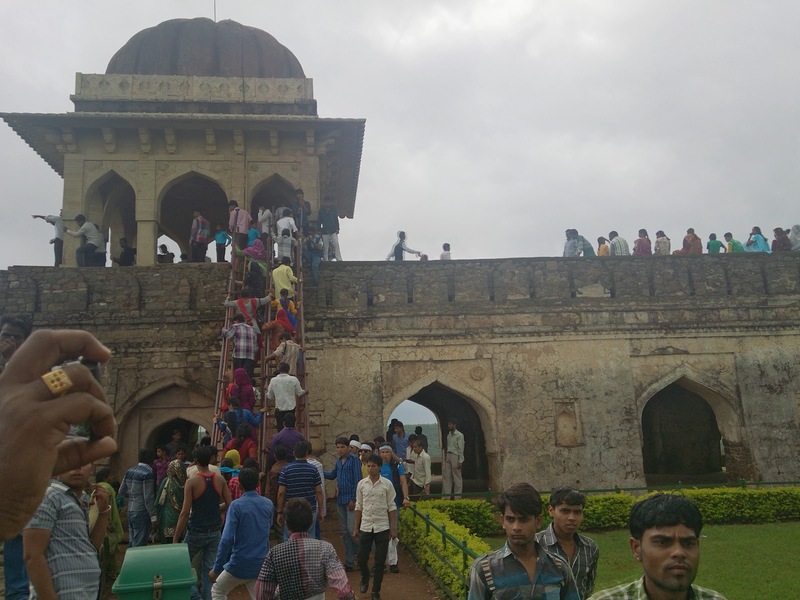 The great Mughal Akbar decided to invade Mandu and capture roopmati and baz bahadur. Akbar sent Adham Khan to capture Mandu and Baz bahadur went to challenge him with his small army. No match for the great Mughal army, Mandu was easily defeated fell. 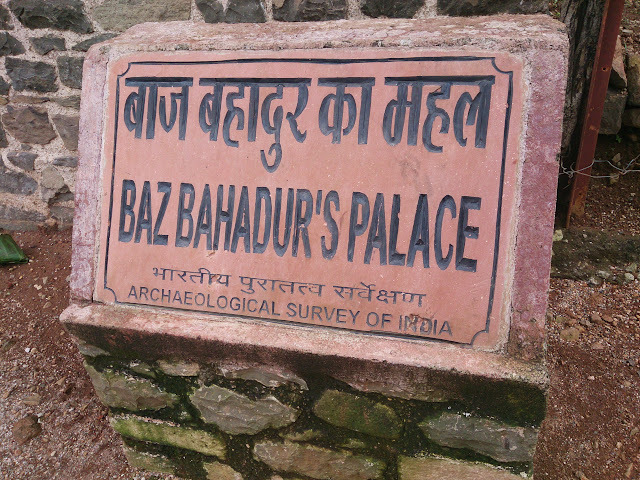 Baz Bahadur fled to Chittorgarh to seek help. 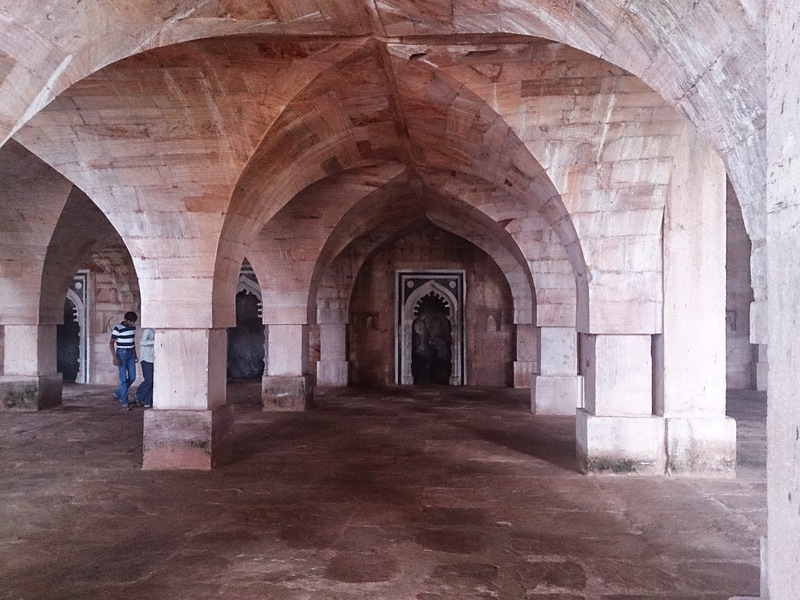 As Adham khan came to Mandu, was surprised by the beauty of roopmati and Rani Roopmati stoically poisoned herself to avoid capture. Thus ended this magical love story steeped in music, poetry and beauty. In 1599, Ahmad-ul-Umri Turkoman, who was in the service of Sharaf-ud-Din Mirza wrote the story of Rani Roopmati in Persian. He collected 26 poems about her and included them in his work. The original manuscript passed to his grandson Fulad Khan and his friend Mir Jafar Ali made a copy of the manuscript in 1653. This copy passed through several hands before it reached a gentleman named C.E. Luard. In 1926 it was translated into English by L.M. Crump under the title, The Lady of the Lotus: Rupmati, Queen of Mandu, A Strange Tale of Faithfulness. Here is an excerpt from the english translation. her bedchamber she took poison of powdered diamond. If one climbs on the roof of Baz Bahadur's Palace, there is a clear sight of Roopmati's Pavilion. 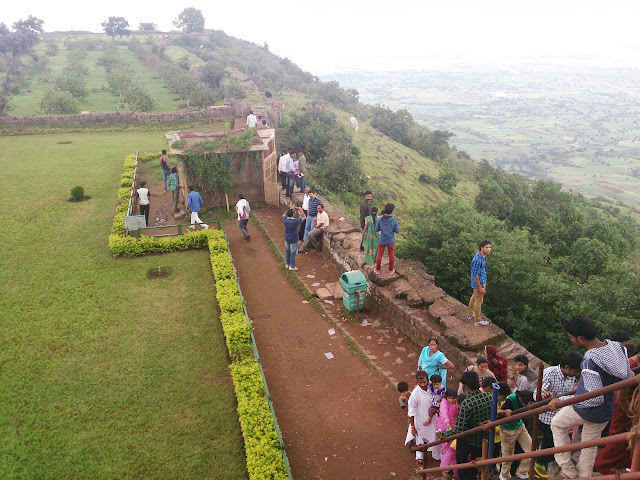 The distance between Rani Roopmati's Pavilion to Baz Bahadur's Palace is around half a kilometer but it is a steep climb. View from Top of Roopmati Pavilion Baz Bahadur's palace is visible in top right. The pavilion itself does not seem to have any residence, it is just a place where one could look around. As you can see in pictures above, because of it being a holiday, there are people everywhere and it was really crowded. 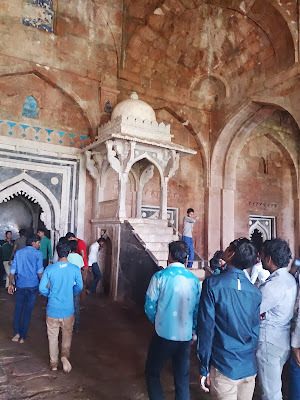 There is a makeshift stair which leads you to top and as you see in the picture above, it was also crowded. At times it felt like there is a stampede waiting to happen here. Anyway, we got down from this place and walked back to our car which was still in the traffic jam. 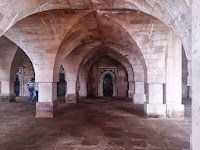 We had planned to visit Jahaj Mahal as well but ran out of time. 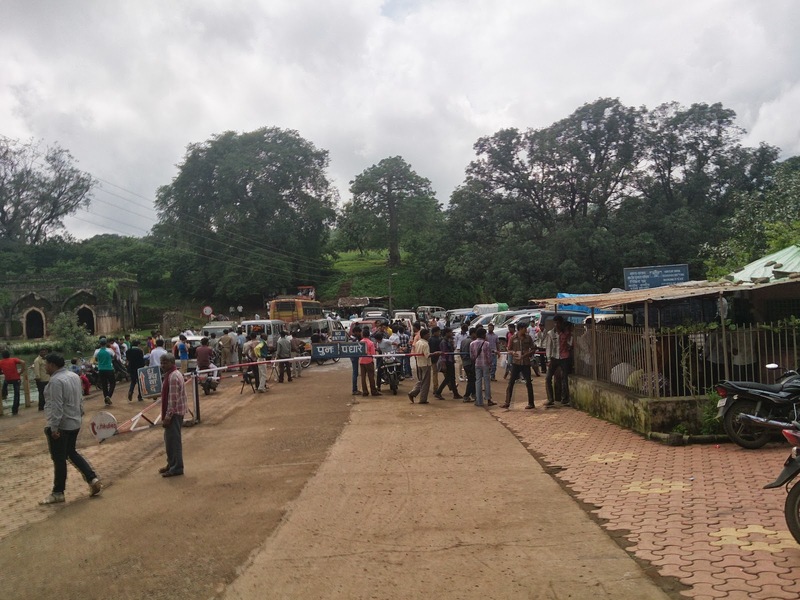 That place was also jammed with vehicles and since most ASI monuments shut down at sun-set we did not even take chance and traveled back to Indore. Just to sum it up, it looked like a nice place but probably it is best to avoid it on holidays.